Children will learn the letter R quickly when they are surrounded by these lovely bright printables! Modelling a rainbow with playdough is great fun, but what other R words can the kids come up wtih? As a child I always found the lower case "r" a little tricky. I would have enjoyed forming it out of playdough with the help of a mat like this! Make a big letter R out of playdough - with the help of this fun playdough mat - and help the kids remember how to recognise and form the letter! Working our way through the alphabet with this set of fun worksheets, we come to the letter R. Lots of fun to be had here! Learning the letter R? Here is a fun poster to help! Our alphabet of children helps kids remember their letters, and makes a lovely display. Here, a girl holds up the letter R.
Lower case r is one of the trickier letters to remember, I think. But by using this playdough mat you can practise letter recognition and first letter sounds, too. Trace over each letter on these worksheets, remembering to start and stop in the right place. There's plenty of practise here so the kids will soon be confident they can write the letter r in both upper and lower case! Need some personalised writing paper in a hurry? Our illuminated letter writing paper is easy-to-print and looks stunning with the initial letter coloured in. This one is for the letter R, and we've got lined and blank versions available below. These bright, colourful printable letter R lacing cards are designed to appeal to the kids, who will be working on their fine motor skills as well as learning their letters! A useful activity when R is the letter of the week, perhaps. Use our letter templates to help young children to recognise and write letters of the alphabet - print out the templates, then laminate to use with playdough, glitter, paint and so on. They're also great for crafts and colouring. 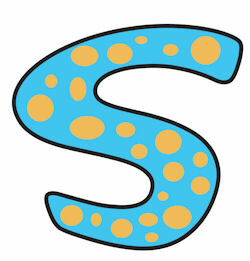 This letter R is fun, quirky and guaranteed to brighten up playrooms and classrooms. Our letter templates can be printed and simply coloured in, or decorated in lots of ways - leftover wallpaper, wrapping paper or even maps and old sheet music can all be used to create fabulous letters! Children can trace the letter R - both capital and lower case - with this simple printable. Isn't this racoon poster fun? Hopefully it will help the kids to remember the "r" sound, too.